The Sunburst Honeylocust tree, Gleditsia triacanthos inermis, 'Sunburst', is smaller in stature than the common Honeylocust tree. 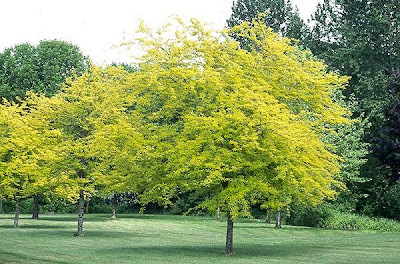 Sunburst Honeylocust trees display yellow new growth, and the yellow leaves persists throughout the season. The wood is dense, hard, and durable. The Sunburst Honeylocust is fast growing up to 2 ‘ a year. It is a very fine textured tree with a broad, pyramidal crown, and an excellent lawn tree for filtered shade. This deciduous tree displays clusters of yellow-green, fragrant flowers open in May-June. The leaves are divided into many small, oval leaflets giving a fern-like appearance to the foliage; leaves are normally green, but the 'Sunburst' cultivar has light yellow leaves. This tree is a version of improved thornless, podless varieties. Easy to transplant because it withstands a wide range of conditions. Does best in moist bottomlands or soils with high pH. Prefers full sun. Extremely salt tolerant.